Every 16 minutes, a person is killed or sustains injuries in an accident involving 18-wheelers, tractor-trailers, or semi-trucks. No one wants to be hit by a truck due to their pure size and power which may leave victims critically injured or dead. Truck drivers sometimes contribute to this risk by driving fatigued. Other common causes are of accidents are drugs, alcohol, mechanical failure, bad weather, improper maintenance, overloaded cargo or bad judgment. Each year the number of large trucks involved in fatal crashes has been increasing. As this figure rises, the threat of casualties resulting from accidents involving heavy trucks grows causing our roads to be more and more dangerous. Commercial truck drivers are regulated through state and federal guidelines. They are expected to drive responsibly and cautiously. 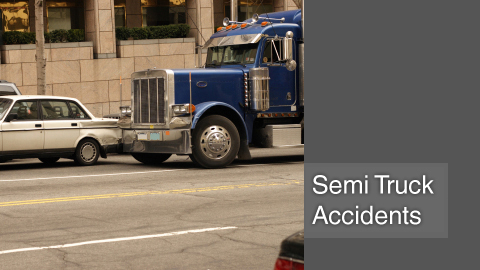 California law protects drivers who become victims of negligent truck drivers. These victims deserve to be compensated for their losses, including but not limited to pain and suffering, lost of income, medical expenses and future losses. In many cases the trucking or insurance company will claim that they are not liable or make your claim exceedingly difficult to file, even if, they have conceded responsibility. If you or someone you know has been injured by a Truck driver, please contact one of our truck accident attorneys in Beverly Hills at 1-888-97-97-97-8 for a free case evaluation.